Used Tyres Scrap, offered by us, is widely acknowledged for their abrasion resistance, high strength and durability. We obtain Used Tyres Scrap from the top-of-the-line and approved Tyre Scrap producers and manufacturers in the domain. 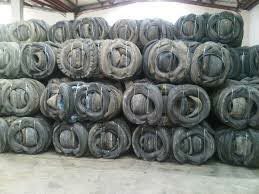 We are a noteworthy Used Tyres Scrap Exporter and Supplier from Thailand. We make them available in various grades and specifications. Buy them from us at reasonable prices.